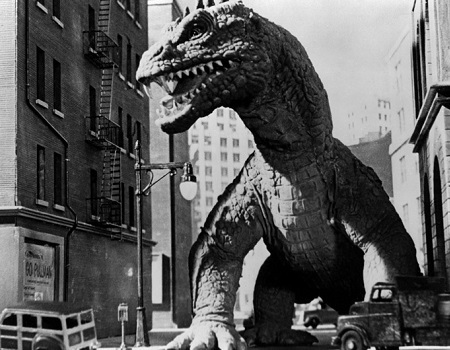 Think of The Beast From 20,000 Fathoms as a much, much better version of It Came From Beneath the Sea; predating Gordon's film (as well as Ishiro Honda's 1954 masterclass in giant monster cinema, Godzilla), nuclear testing ends up thawing a hibernating dinosaur and stirring it from its prehistoric slumber. As expected, the thunder lizard wakes up on the wrong side of the bed and rages up and down the East coast, making stops in Maine, Massachusetts - and eventually Coney Island for a fiery finale. Where The Beast From 20,000 Fathoms differs from It Came Beneath the Sea is in spectacle. The latter happens to be lighter on havoc, while the former levels entire city streets and burns seaside amusement parks to the ground. If the monster (yet another Harryhausen creation) isn't knocking buildings down and burying bystanders in rubble, it's infecting them with its contagious, virulent blood. Maybe the king of all monsters did this sort of thing better, but Eugene Lourie's Rhedeosaurus did it first.